Can’t begin to tell you how hard I’m smirking… Because any of you who know me and know that I’m actually IN the sky winging home from The Design Blogger’s Conference in LA know that there’s a very good chance that Scary doesn’t mean Scary Bad. You see, I did my talk and I’m still alive, but one aspect of my talk is getting your reader’s attention. Nobody is going to open up a post with this title. Two Fabulous interior decorators who gave keynote speeches at the Design Blogger’s Conference. Oh, yes, of course, some of you will. Since one of my key points was for design bloggers to rock their headlines, I figured I better not disappoint. And while we’re on the subject, or rather, *I’m* on the subject, lol, thank you, thank you, to the many well-wishers and those of you who were actually there to cheer me on! Back to the topic at hand… The definitely NOT scary interior decorators. Two have been featured on the blog before, and one is new to me. But here’s what’s super interesting. Two out of the three had NO formal interior design training and all three catapulted their careers solely through their blogs and social media. Through that came all of the other good stuff like book deals, etc. Two are living in California and the third is in Salt Lake City. While there’s some overlap in all of their work, each has at their core, a relaxed, comfortable casual vibe. Let’s begin with the young husband and wife team of Syd and Shea McGee of Studio McGee. You may recall that I featured their work in this post about Simply White. Shea was the speaker and what happened is that she had always had an interest in interior design. Her husband lost his job and from there, she began decorating. She started her blog and an instagram account and now has well over 400,000 followers. They have a staff of 30. And all this has been accomplished in barely three years! Wow. Just wow! Adorbs, they are. Oh, did you know that in addition to starting this mega-business, Shea has had two kids? Yes, I had two little kids when I began my biz in 1996, but I didn’t have 30 employees, speaking engagements, a blog, a shop and let’s not forget social media. But then again. The 30 employees are doing a lot of the work, I’m sure. It’s no wonder that their style has taken off. 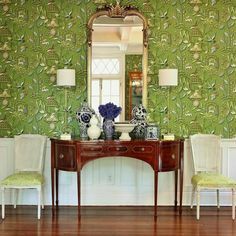 It embodies a fresh, young-traditional style that’s tres easy on the eyes. Recognize the Pyne Hollyhock from F. Schumacher? I love the juxtaposition of an ornate framed oil painting against stark white walls. Blue and white prevail in their designs, but they have gotten more adventurous with dark colors, with some jobs. I love this chic office with the Oriental rug and combination of black panel moulding with white built-in cabinetry. Last summer, they launched their shop, McGee & Co.
Amber Lewis of Amber Interior Design is the designer that’s new to me. She was a keynote speaker and a most interesting foul-mouthed (by her own admission) woman of enormous talent. She opened her talk admitting that she was nervous, but I’m not sure why. She gave a terrific talk! Hers was another tale of adversity and she too, used her website/blog as well as instagram to propel her business which only began in 2010. She describes her look ast BoHo Chic, but I see it as being not dissimilar to the interiors of Studio McGee. Both design firms feature white walls with blue accents in their interiors. Both mix in antiques and fine art to their more contemporary rooms. I love how she takes a very traditional sofa and inserts in this contemporary but classic home and it looks fresh and very happy in that setting. I think that her mix is just right. If my memory serves me correctly, Amber was working for another designer and lost her job and possibly her husband lost his job or something and she needed to scramble. Something like that. My mind tends to wander at these things as it’s a lot to take in. I do know that she has a design background, but am not sure if she was formally trained or not. Amber Lewis has both a physical shoppe (yes, with a double P and an E which I suspect is meant to be irreverent coming from a casual Cali girl) and an online version of the shoppe as well. 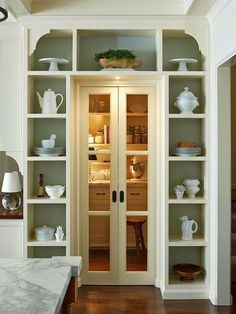 Love this kitchen which is reminiscent of some of the English kitchens I’ve been featuring. I think that the antique runner makes the room! And finally, we have the fabulous husband and wife team of Steve and Brooke Giannetti. Steve of course, is a licensed architect and owner of Giannetti Home, but what I did not know until yesterday is that Brooke is not trained as a decorator. She did a house for a friend. Started her wonderful blog, Velvet and Linen and then from there, the jobs began pouring in for both of them. And well they should. They are both so incredibly talented. And I’m torn between which one of Steve Giannetti’s houses I want. While Brooke’s interiors retain the casual laid back vibe of the other designers, her look is more detailed and layered– a little more grown-up. Although I can’t exactly explain what that means. I love this house too! Not only is Steve an immensely talented architect, he’s also a fine artist and furniture designer. The Giannettis too, have an online shop with higher end offerings. These are chairs that Steve designed. I adore them all! They also use a lot of Swedish influenced and/or authentic Gustavian pieces in their work, which I love. One more view of one of Steve’s homes he designed for clients. Patina Farm tells the story of the building of Brooke’s and Steve’s dream home in Ojai, CA. All of these interior decorators followed their dreams and made it happen. I find that inspiring, even though I know that it’s not easy. And sometimes it’s not even easy to know what our dreams are! Brooke Giannetti says that it’s important to have a mentor when starting out as a designer. I couldn’t agree more with that and that goes for those who’ve had formal interior design education and those who have not. Talent is not something that can be taught, but there’s still much to learn about the business. Still, it is possible to become a designer if that is where your heart is taking you. I’m intrigued by the color of blue in the cabinetry on the Amber Interiors white marble kitchen. Do you know what it is? LOL – sorry about that! And thanks for the chuckle! That blue is a beauty, isn’t it. I don’t know what it is. I could make an educated guess, but there are so, so many factors. Do you have my paint collection product? There are three wonderful warmer dark blues in there. The information about it is here. Answering in reverse order. haha. I don’t know if the color wheel will help much, but the paint product is nearly 500 pages of 144 colors, palettes using the colors, palette families where all the colors in the families go with each other, 40 interior design boards with furniture, the paint colors and links to the sources! O Laurel, you lured me with your heading, but then, as always you grabbed me (I want to say by the balls – but I’m not sure if I should, plus I don’t really have any) with your fabulous, funny, inspiring content. Right. They thought I was going to say something else. I had a slide that I made with a beautiful ballerina standing on point en attitude derriere (for you dancers out there) at the end of a branch. I am an Interior Decorator from South Africa, and have been in the business – for 34 years. I am inspired constantly by the beauty that surrounds me and the people that I work with. I have only recently found your blog, and really enjoy the comments and information you share. To say nothing of the wonderful pictures you offer up. Very pleasing indeed. I’ve been to South Africa, Cape Town, for the most part and it is the most beautiful place on earth! McGee has mastered the art of using social media. For awhile it was just pictures of the same rooms from different angles, but it made it seem like they were doing hundreds of projects when they have only done a few. Marketing genius right there! These homes look very much like what we were doing in the 80’s – white walls, creams, navy blue, and a punch of dark wood. All that layered white trim work and even black lanterns are a return to that same vibe. Like fashion, design is circular. You are so right about the marketing thing. All three designers are a testament to the importance of beautiful images! But, I’m wondering where you live because around these parts, the eighties was not like this. I wish that it was! 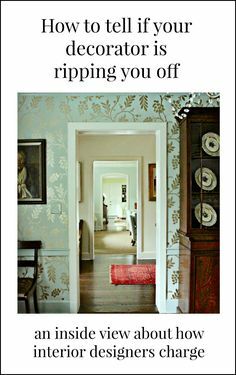 Around here, it was chintz, chintz, chintz and lots of trim and other excess. Thanks! Took your advice on the internet search. Called a designer who offered a no obligation one hour consultation in my home. Sounds like a good start. Thanks for giving me the confidence to take the plunge to search for a professional. Can’t thank you enough! After reading all, I met with several designers and had my list of questions ready. Even better, I felt informed and could really understand their replies. I felt much more empowered to make an intelligent selection. I couldn’t have done it without you. I really appreciate the time and effort it takes to write these informative posts. PS. 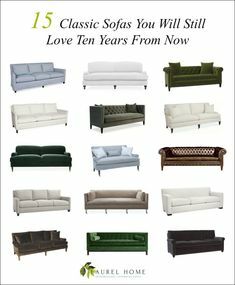 The selected designer offered one of your preferred companies as a good sofa option. (Lee). Must say, that helped too! Hi Amy. Glad it helped! what a great post! I so enjoy all of your posts tho! I hope you will be at DBC again next year- I really want to attend, and hope to bring our mutual friend Kristie (thedecorologist) with me. I could kick myself for not attending when it was closer to us in Atlanta. thank you for your always educational, witty, and inspiring posts! Thank you so much! It would be great to meet both you at Kristie! And yes, these three speakers were particularly inspiring. The McGees and Amber Lewis were inspiring in that they were in a difficult financial situation. No, that was not a troll comment at all because of the way you put it. Respectful differences of opinion are always welcome. Some people don’t understand that means including an understanding that others might like something they don’t. I understand your point and also don’t entirely disagree with it. One thing of course, is that the images are styled for the photos. But it is a very specific kind of look and it won’t be everyone’s preference. That is also part of the point. I was told early on that the most successful designers find ONE look and run with it. I didn’t do that because I was thinking locally and needed to do whatever was the prevailing thing in my area. The McGees are taking on projects all over the country now. They have 30 employees and clearly they have found their niche and are running with it! My uncle has a degree in city planning. Every time a new mayor was elected, he lost his job. So, he worked in furniture stores and accidentally developed an interior design business and then started flipping houses before anyone knew what that was. He says that was easier, houses don’t have stupid ideas and argue with you. Even now, he’s in his 80s and his homes look like magazine covers. But… I didn’t inherit any of those genes. And usually “modern” art leaves me feeling kinda dead inside, those Steve G “ocean” paintings are so very very beautiful. I would never trash anyone with true talent and design education is no more equated with ability than money = taste. I find the look these designers are creating feels accessible for a lot of people. Sherry, I once worked assisting interior designers at a design studio for a couple of years. I can tell you from experience that a design degree is NOT a guarantee that they can deliver inspired design. There are loads of people with design degrees that design trite and mediocre interiors. Design comes from the soul. If you don’t have the talent, no degree is capable of giving it to you. One of our most talented young designers had her degree, but couldn’t pass the NCIDQ exam to save her life. Some designers were great and others churned out the “mediocre” designs you complain of, despite their degrees. I don’t usually publish inflammatory comments but I’ve had it! Apparently, some people find inspiration and others struggle seeing other people making a success out of their lives. Fine, I get the latter, but to come on someone’s blog and insult her, the other readers AND the amazing designers that I’ve chosen to promote is someone who deserves to get shat on from a dizzying height. FYI, It’s the other way around bitterbitch. Brooke’s husband piggy-backed on his talented wife’s success!!! Not that he needed to. The point was to show the power of the beautiful blog that Brooke created. Hi Dean. How cool is that! My older son went to NEC for jazz trombone, but plays piano and drums too. Nothing goes to waste. And especially with all of the arts. They are all connected. At the NYSID, I needed 4 more credits for an associates degree and I had 12 dance credits from the U. of WI. The dean looked at me like I had 6 heads and said that I had to be joking. Certain types of blogs *are* dead because folks are tired of blogs that don’t have much substance. It’s not novel anymore. I was familiar with all 3 of these designers. And I love their work. Indeed. Mama wasn’t kidding. Insults aren’t cool. And what irks me the most is that they write as if there isn’t an actual person on the other side reading those hurtful comments. Those designers will most likely see the post through social media if nothing else and then there are the thousands of those designers’ clients. It’s a small world and about a square mile, in the world of design. Well, in Brooke’s case, she’s married to one of hers lol. But, I think that she has friends in the business too. Short of that, one would probably have to either be employed by or pay someone to teach them the ropes. The other possibility is to have someone on call, as a sounding board. The third is to hire someone as an associate. But in that case, it would have to be someone who has the power to draw in enough business. This has happened to a lot of bloggers who’ve started a blog and THAT propelled them to begin a career as a designer. I know of a couple who found out very quickly that it’s not nearly as easy as it looks. Hello Laurel, Although talent cannot be taught, it can be recognized, developed and fostered. I do have one cavil with the Giannetti living room. Although I love architectural salvage, and I think those columns are great, they appear unsupported, and a small child could knock them over. Even if they really are secure, they don’t appear so, which would make me nervous. Safety (especially child safety) should always be paramount over appearance. Thanks so much Travis! I opened my business 21 years ago and that was after working for others for 4 years and 3 years of interior design education. I’ve written about design school. For residential work, I found it to be largely a waste of time; not all of it, but too much of it. I don’t know if it’s changed. This was back in the late 1980s. What I do believe though, is that it’s a very good idea to work for someone or at least have design help. How kind you are! I worked really hard on the talk. I figured I only had one chance and if I blew it, that would be that. OH NO! Untrained design peeps running amok! Someone should alert all those associations known by their various acronyms about these people. Kidding aside, I love seeing people follow their dreams and actually take action to make those dream come true. Yep, you weren’t too far miles-wise but with traffic, it would’ve been a 2-hour trip out there for me. Did you see below, that Crystal Ortiz had some nice words for you! And well-deserved too! Anyone needing interior design coaching/mentoring, Alycia is one who knows what she’s talking about! Truly, I love so many different styles of design, but in these three designers, there is still a classic bent that I love. It’s not just a mishmash of fabrics which I sometimes see, but a combo pack of tradition with modernity. I do have some other posts with this look. Or, at least images interwoven. To be honest, I don’t even know what an east coast look is anymore. Laurel– I have to admit, I clicked over thinking you were going to dish and rant about these so-called untrained interior designers. And it was refreshing that you went through their work. And while you’re right, there is much to learn about the business, it’s great that you left an open room for new inspiration. I needed to make several points with this post. I figured some conference folks would be reading and I wanted to demonstrate some of my points. And who doesn’t love to be surprised? LOVE it Laurel!! Go get ’em!! They do the same thing to gorgeous ballerinas on youtube. No wait. It’s worse. Much worse sometimes. And the more talented the dancer, the more vile the comments! I guess it makes them feel better about themselves when they tear others down. I feel sorry for them in a way because happy people don’t tear other people down without provocation. It’s not an excuse, however. Bingo! That is absolutely right. These are artists with an eye for proportion, balance, color and all of the rest. Is that the same light fixture in the white living room by Brooke Giannetti and in the dining room by Shea McGee? If not, they are awfully similar and I love the look! I’ll take one! Yes, it is!!! And it’s available at Circa Lighting.